As horror stories from the TSA become an ever-expanding genre, it is important to remember that the entire roiling controversy over airport security has come about solely because of the government’s refusal to acknowledge the true nature of the threat we’re facing. While it is theoretically possible that a wheelchair-bound, eighty-year-old Baptist grandmother from Des Moines could hijack an airplane and crash it into an American landmark in the service of Allah, the likelihood of her doing so is infinitesimally smaller than the possibility that such a thing might be done by a young Muslim male of Arab or Pakistani origin. 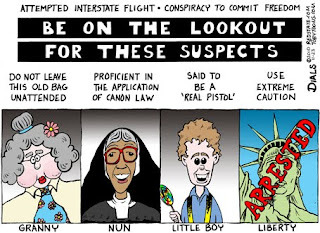 And so the only thing left for the TSA to do, if it is really serious about protecting Americans and not humiliating us or stripping us of our freedoms as well as our clothes, is profile: to admit that Muslims are much more likely than other groups to be plotting terror attacks, and to screen passengers accordingly. Such profiling would not be perfect. While Islamic advocacy groups cry racism at any hint of such scrutiny being directed toward the Muslim community in America, in fact the jihad threat to airliners in this country has nothing whatsoever to do with race, and everything to do with a murderous and supremacist belief-system that is held by people of all races. The 9/11 hijackers were not wearing the “Islamic garb” that Juan Williams confessed worried him, and indeed, al-Qaeda directs its operatives in Western countries not to wear such distinctive garments, but instead to blend in. Nonetheless, to direct greater scrutiny at airports to young Arab and Pakistani males than to Aleuts from the Yucatan or socialites from Bel Air is not racism, it’s realism. The 9/11 hijackers were motivated and energized by their belief in Islamic jihad; so were the July 7 London bombers, the March 11, 2004 Madrid bombers, the November 2008 Mumbai mass murderers, and those who have been responsible for thousands of jihad attacks around the world since 9/11. If the TSA, and the DHS, and the State Department, and all the rest of them, acknowledged the reality of the Islamic jihad against the U.S. instead of ignoring and denying it, it would be possible to formulate some sensible screening policies based on an assessment of the actual threat to air security, instead of what they wish that threat were – which wishful thinking is the basis for the current TSA policies. Yet while that would be an easy solution to the fix we’re currently in, it is one that will never be adopted. The TSA currently wastes huge amounts of time, money, and resources by pretending that everyone is an equal threat to launch a terror attack. Islamic advocacy groups such as the Hamas-linked Council on American-Islamic Relations (CAIR) do all they can to perpetuate this state of unreality by claiming that Muslims in general would somehow be victimized if the government adopted more realistic policies. They raise the specter of a “backlash” against innocent Muslims, with willing aid from a compliant mainstream media – and yet the FBI’s hate crimes report for 2009, released just last week, showed that Muslims lagged far behind Jews in hate crimes in the U.S. last year, accounting for only eight percent of crimes classified as such. Innocent Muslims are generally not being victimized in the U.S., and would not be if the TSA devoted its resources to halting the real threat rather than stopping a fantasy jihad of Oprah book-clubbers. The only sensible answer at this point would be to institute Israeli-style profiling of air passengers. The Israelis have run an efficient and terror-attack-free air service for years, without all these invasive security measures. But to emulate them would mean to recognize in an official way that Muslims are a greater risk to commit terror attacks than Methodists or Mennonites. And in today’s politically correct environment, the Obama Administration and the TSA look as if they would rather see another jihad mass-murder of American citizens on the scale of 9/11 or worse than do anything to suggest that.